The Barkhausen effect is a name given to the noise in the magnetic output of a ferromagnet when the magnetizing force applied to it is changed. 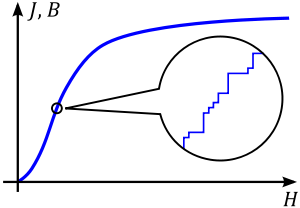 In the picture: Magnetization (J) or flux density (B) curve as a function of magnetic field intensity (H) in ferromagnetic material. The inset shows Barkhausen jumps. Discovered by German physicist Heinrich Barkhausen in 1919, it is caused by rapid changes of size of magnetic domains (similarly magnetically oriented atoms in ferromagnetic materials). Barkhausen’s work in acoustics and magnetism led to the discovery, which provided evidence that magnetization affects whole domains of a ferromagnetic material, rather than individual atoms alone. The Barkhausen effect is a series of sudden changes in the size and orientation of ferromagnetic domains, or microscopic clusters of aligned atomic magnets (spins), that occurs during a continuous process of magnetization or demagnetization. The Barkhausen effect offered direct evidence for the existence of ferromagnetic domains, which previously had been postulated theoretically. Heinrich Barkhausen discovered that a slow, smooth increase of a magnetic field applied to a piece of ferromagnetic material, such as iron, causes it to become magnetized, not continuously but in minute steps.